METAIRIE, La. – DeMarcus Cousins says his prayers have been answered, although not necessarily in the way he expected. The New Orleans Pelicans’ newest All-Star maintained Wednesday that he liked Sacramento and initially wasn’t happy about being traded Sunday night, but added he’d become frustrated waiting through six-plus losing seasons for the Kings to add more elite players. “I would go home, just stressed out, pulling my hair out, you know, praying, praying, praying: Just send me some help,” Cousins said. 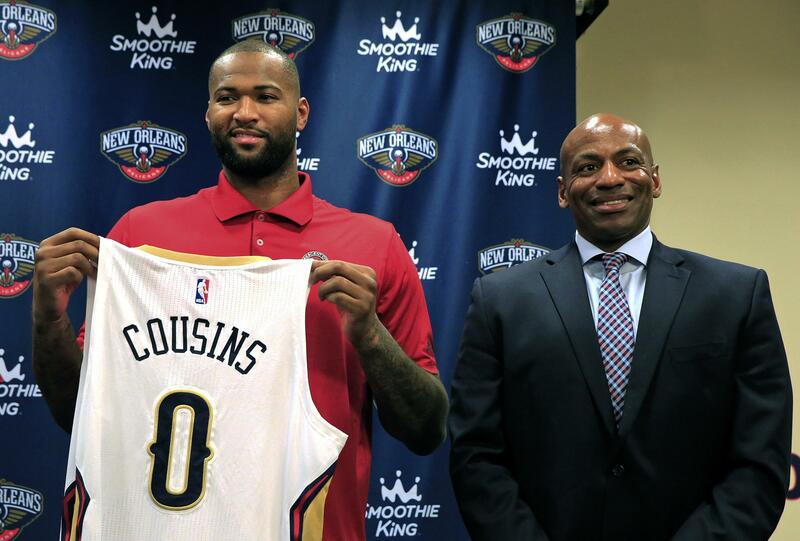 Cousins is the one who wound up being sent away, but to a team where he joins fellow 6-foot-11 All-Star Anthony Davis. In New Orleans, they’re calling the tandem, “Boogie and Brow,” the former being Cousins’ nickname and the latter a reference to Davis, known for his connected eyebrows, or unibrow. Davis and Cousins debut as Pelicans teammates at home Thursday night against Houston – a game Davis has eagerly awaited since learning of the trade Sunday night. The deal excited him to the point he had trouble sleeping and texted Cousins around 3 a.m. Monday. Cousins’ was up, too, and texted back. Cousins is averaging 27.8 points and 10.6 rebounds this season and can become a free agent in 2018 unless the Pelicans sign him to an extension. Davis is averaging 27.7 points, 11.9 rebounds and 2.5 blocks per game this season and is coming off his fourth straight All-Star game. On Sunday night, he scored an All-Star game record 52 points and was named MVP. Without using the term “Big Three,” general manager Dell Demps insinuated that he sees the two former Kentucky big men and point guard Jrue Holiday – a former Eastern Conference All-Star – in that light. “We just felt that those three guys, putting them together, it’s exciting just to think about the possibilities,” Demps said. Holiday, who has struggled with injuries since being acquired in 2013, has been healthy this season and is averaging 16.3 points and 7.5 assists. The key with Cousins is how he manages his notoriously combustible on-court disposition. Asked to describe how intense of a competitor he is, Cousins grinned and said, “about 17 technicals worth,” referring to his league-leading technical foul total. His 16th technical foul resulted in a one-game suspension, as would his 18th, 20th and every two after that for the rest of the season. Still, Cousins said he was not averse to trying harder to reign in his emotions – a little. Davis said he’ll be ready to step between Cousins and officials or others to try to keep Cousins calm when tensions rise. The Pelicans’ can’t afford any suspensions. They are 2 1/2 games out of the final Western Conference playoff spot with 25 games left. They need quick results from the Cousins deal, which also brought New Orleans forward Omri Casspi in exchange guards Tryeke Evans, Buddy Hield, and Langston Galloway, along with first- and second-round draft picks this summer. If the Pelicans make the playoffs, they’re first-round opponent likely will be the Golden State Warriors, who currently holds the top seed and now see New Orleans as a more formidable foe. Cousins’ new team plays just a two-hour drive west on Interstate 10 from his native Mobile, Alabama. Cousins said he’s pleased to be closer to home. Published: Feb. 22, 2017, 9:23 p.m.